The Logile Integration team has decades of industry experience integrating enterprise wide applications using ETL and other technology to connect our applications with other ERP and internal applications. Logile’s robust data repository can accept and manage all the data associated with your Labor Management needs along with any data elements needed to support Operational Reporting, Dashboard metrics, and Performance Management. Data sources typical include multiple extracts or normalized transaction logs from POS, General Ledger, Category Management master item records, scale data, POS cashier productivity information, reconciled statistical data, Payroll system accrual balances, etc. Once in the system, these data elements can be leveraged for dashboard or formatted reports as well as for ad hoc queries. Through this capacity you can provide Store Operations with a single source of information for all their data needs in the format(s) you choose to present them in. We support near real-time data collection and updates. Additional real-time capabilities include integration for in-store re-forcasting and promotional triggers that can be supported through the use of various technologies including beacon devices. When coupled with Loyalty Marketing data integration, we can trigger the delivery of targeted merchandising offers to enhance sales and customer experience. Our data integration is based on Kettle™, the ETL engine from Pentaho™. We provide data integration as a service solution to your POS, HR, General Ledger, Payroll, Volume, Case and Item Movement and other ERP applications and also to your data warehouse, Big Data, OLAP and other data sources. 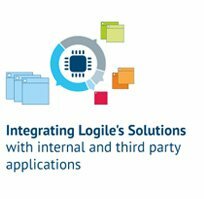 It is Logile’s goal to create a seamless interaction experience between our software modules and all your related applications and hardware. All our modules are supported via mobile functionality that enable engineers and store personnel perform their work either through desktop or mobile device interaction including growing support for Logile’s AI automated assistant Lychee™ or through integration with Alexa. Connectivity to other systems in near real-time is achievable for fast, current and accurate information available either at the desktop or on virtually any mobile device. System performance is critical to you and your store users. The power of the system must be matched by the system uptime and scaled to perform to your Service Level Requirements. Logile uses state of the art load testing and load balancing to help you architect your system requirements and to manage and monitor the performance of the environment for your stores. We use advanced web analytics to monitor performance and ensure your satisfaction. We recognize that as more clients migrate toward near real-time data accessibility that the monitoring and management of system uptime and performance is critical to driving your return on investment. We can work with you to design specific web analytics reporting or alerts to keep you informed of system performance across your enterprise.